Inder Loves Folk Art: Celebrate the Boy! After finishing up Steve's shirt, I needed a quick and easy project - some fast if not instant gratification before I start making dresses for myself, a project that requires I learn some actual pattern drafting skills (fun! challenging! intimidating!). So I broke out the adorable oliver + s Sailboat Top and Pants pattern, which I ordered a few months back, and whipped up a pair or seriously adorable sailor pants for Joe. The pattern was everything that the sewing blogosphere had promised - well drafted, with clear and straightforward instructions. Although the project seemed a bit too complicated to finish in one day, I actually had no problem putting these together in a couple of hours using a leftover piece of red linen I had in my stash. Of course, the fact that I am now a ninja buttonholer didn't hurt. Yes, it's true - by the time I did my ninth buttonhole on Steve's shirt, I had thoroughly conquered my fear of buttonholes. Yay! Thanks Joe, the toy cars were a nice touch. These are a little summery for Bay Area winter (or, let's be honest, Bay Area summer): good thing Joe runs hot and never seems bothered by the cold. I tried to take some photos of Joe wearing the pants, but he was all over the place. I couldn't get him to stop moving (this must be how he keeps warm). 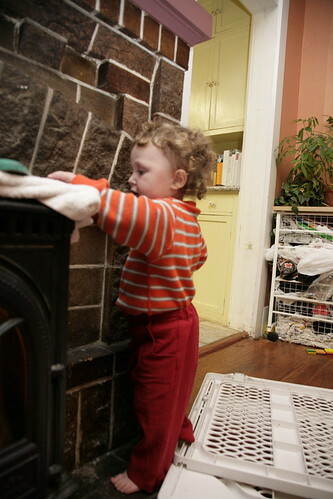 And of course he chose that moment to play with very non-photogenic items, like the baby gate we use to gate off the kitchen. 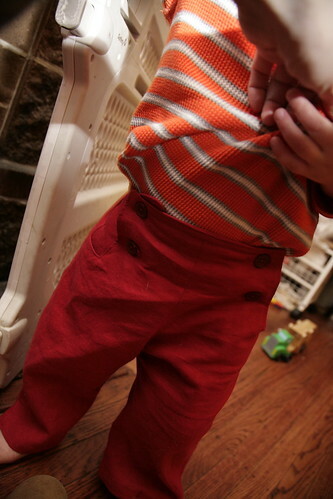 So I got a ton of shots like this one - a blur of red and orange and boring household stuff, and you can't see the pants at all. Coincidentally, one of my favorite sewing blogs, Made by Rae, just kicked off a month of sewing to "Celebrate the Boy!" Recognizing that boy's clothes really "get the shaft" in the pink-dresses-and-ruffles-obsessed sewing world, she does an annual month of posts on sewing for boys with cute photos and other goodness. So, what the heck, count me and my squirmy, unphotographable toddler in! I added "The Boy" button to my sidebar, go check it out! Even if you sew for a little girl, it's just really refreshing to see simple, bold styles in non-floral prints. Oh my goodness! You are really making me wish I knew how to sew! Those pants are incredible. I LOVE them, though I am curious how you get him to hold still while you button them. :) Also, you are so right about boy clothes. They get really boring, and it makes me mad. Why do we believe boys should not wear color? Will it really endanger their masculinity to wear red or orange? And the drabness and insistence on sports or car/truck/tractor motifs... don't get me started. 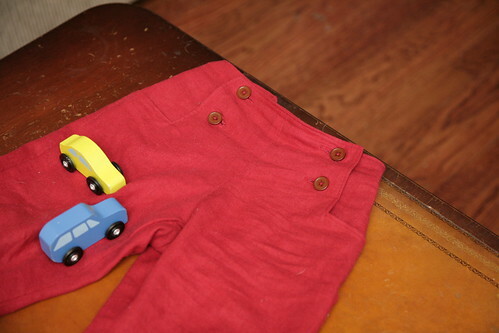 Secret: The pants have an elastic back, so they pull on, without undoing the buttons! Technically, I probably didn't need to buttonholes at all! But I had to use my ninja skills! 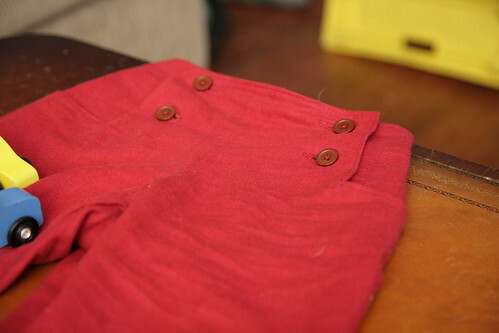 I know, I was making these red sailor pants, and I kept thinking, "these look kind of girly." But then I would follow up that thought with, "that's ridiculous! boys can wear red!" So. Yeah. I love colour on boys,feel free to check out my photos on Flickr,lots of colour! Those are awesome! As always, am super impressed with your sewing! Nice! Lucy runs hot too- crazy kid is having "quiet time" (since naps seem to have ended) and stripped off all her clothes, per usual, and is happy, warm and naked and it is 62 degrees in the house. Agh. @motherof5: I was just perusing your blog, and wow! You've got some mad sewing skillz there! I want to try the Sketchbook shirt and shorts combo ... I don't have the bedtime story PJs, but I really want that pattern - sadly, it seems it's out of print? My child, the Indie Rocker.